Yes, so in November 1999 I hit a bottle on the road and put a nasty cut in the rolling surface of one tyre. 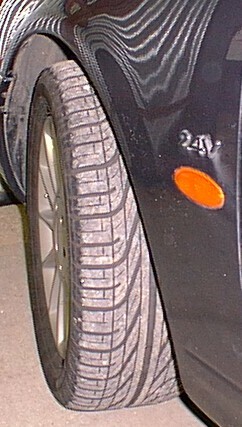 The other front Pirelli was still good for many miles, but it had to go to keep steering and handling integrity. On looking at the rear tyres, they had already run down to the Tread Wear Indicators, and this after only 18 months and 20,000 miles! In any event, despite the tremendous grip, they were very noisy, sending a loud road roar to the interior, particularly at motorway speeds. Pirelli 6000's, big, butch and noisy. New Michelin Pilot HX-MXM - and new Ford sculpted mudflaps fitted too. These save the sides of the car from wheel splatter. My new set of tyres were from the Michelin Pilot range, the HX MXM, Z rated. I chose these for quietness as well as grip, and the MXM showed as a High Speed Cruising type. I changed the two front tyres first and there was an immediate difference. Now it was so quiet at the front the roar from the two still on the back axle was really noticeable. In January 2000 I changed the back two as well and the bill altogether was about £640. Gulp. And the difference now that all four corners were Michelin? I cannot say I noticed any difference in grip, but tramlining was much less evident, the interior sounds as though I have thrown in another half a ton of soundproofing. The ride also felt slightly softer over bumps, and without the thump-crash noise over holes in the road. I felt that it was worth the cost. The MXMs lasted until March 2003, when I noticed that they were down to the Tread Wear Indicators (TWI) on the front two. This was partly because of a failing inner steering rack bush which had caused excessive wear on the nearside front tyre. At the rear, although there was still some tread left, I had a slow puncture on the offside. I have never liked mixing tyres around, especially on this beastie. Handling is much more predictable and safe if all the tyres have identical performance. So I changed the four. I decided to stay with Michelin. I had never been a fan before, having been frightened once by a set of part-worn ZXs in the rain in the late 1960's. But those MXMs had been excellent. I looked for another set, but I found that they were already obsolete. The new Michelin Pilot Primacy promised to be as good - Michelin boasts that they are even quieter than the MXMs. Pete C had already fitted a set and recommended them, so I went with them too. 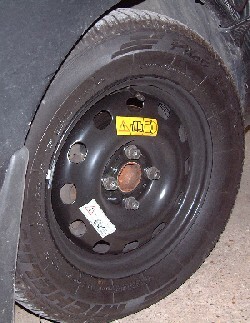 The Primacy is an asymmetric tyre with the outside marked for fitting. I shopped around for some quotes and got them down to £500 all in for the set of four in a 'W' rating - (Zs would have taken a few more days to arrive.) They were fitted while I was watching - one scratch on an alloy and they would buy me a new wheel - but everything was fine. I am very pleased with the Primacy. I do a lot of very long distance high speed touring, often with a good load on board, so tyres are important to me. I need them to be consistent and safe, capable of serious performance - I tend to use the Cosworth's 207 horses - but I don't want the loud roar or drone that 'sports' tyres can generate. The Primacy are quiet and soothing, even on cement motorways, and on a good road they are silent. 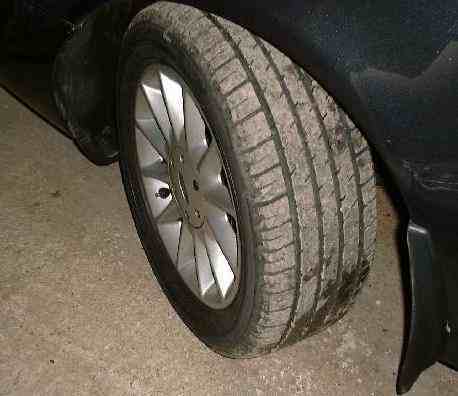 During a touring holiday in the Peak District in September 2004 I noticed the front offside tyre seemed soft. As soon as I got closer I saw the reason - a rusted screw sticking out of the sidewall! Damn - this could not be repaired. I phoned round every tyre place in the area and not one Michelin of this size was to be had anywhere, but in the meantime I could not use this wheel - if I ran the tyre flat I would damage the rim of the alloy wheel, so the virgin spare in the boot would have to go on. I have an extending wheelnut lever I keep in the car, and a good job too, otherwise I would never have got those wheelnuts off, but the steel spare wheel was on quite quickly and was used for a couple of days until I could get a new Primacy. Yes. A Michelin Pilot HX. 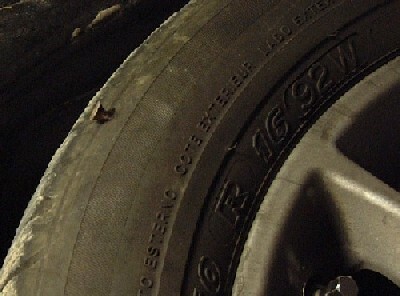 This must mean that, in October 1995 at least, the Michelin Pilot was the original fitment for the Scorpio. Chris C, a 2.3 owner reports that he has replaced his tyres with a set of Dunlop Sport SP01 and noticed an improvement in ride quality and a reduction in road noise. The picture here is from the Dunlop website and it shows a marked similarity with the Primacy: an assymmetric tyre with the same sort of parallel outer blocks, centre straight rails and the inner water-removal channels. Chris C is pleased with his set, so bear them in mind too. Thanks for that, Chris. 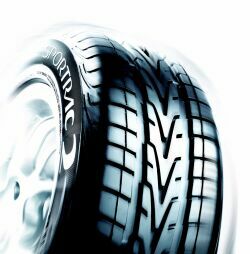 Andrew H has tried a tyre from Vredestein, the Sportrac2. 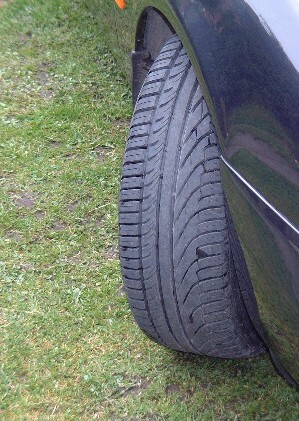 Having driven 3,000 miles on them, Andrew has found them to be quiet and grippy, and at £90 fitted, a great price. There's another tyre to consider. Thanks Andrew.